The Falklands War was fought in 1982 between Argentina and the United Kingdom over the Falkland Islands, South Georgia and the South Sandwich Islands. The Falkland Islands consist of two large and many small islands in the South Atlantic Ocean east of Argentina. The ownership of these islands has been long disputed. The war was triggered by the occupation of South Georgia by Argentina on 19th March 1982 followed by the occupation of the Falklands, and ended with Argentine surrender on 14th June 1982. War was not declared by either side. The initial invasion was considered by Argentina as reoccupation of its own territory, and by Britain as an invasion of a British dependency. It is the most recent invasion of British territory by a foreign power. In the period leading up to the war, Argentina was in the midst of a devastating economic crisis and large-scale civil unrest against the repressive military junta that was governing the country. The Argentine military government, headed by General Galtieri, decided to play off long-standing feelings of nationalism by invading the islands, although they never thought that the United Kingdom would respond. The ongoing tension between the two countries over the islands increased on 19th March when 50 Argentines landed on the British dependency of South Georgia and raised their flag. On 2nd April, Galtieri ordered the invasion of the Falkland Islands, triggering the Falklands War. Britain was initially taken by surprise by the Argentine attack on the South Atlantic islands, but launched a naval task force to engage the Argentine Navy and Air Force, and retake the islands. The British eventually prevailed and the islands remained under British control. However, as of 2007, Argentina shows no sign of relinquishing its claim to the Falkland Islands. Of the 28,000 British airmen, sailors and soldiers who were dispatched to the South Atlantic in May of 1982, 252 did not return. The total Argentinian losses during the war were 649 service personnel. 123 British Army personnel, 88 Royal Navy, 10 Royal Fleet Auxiliary, 9 Merchant Navy, 25 Royal Marines, 1 RAF, and 3 women civilian casualties. The most senior rank killed was Lieutenant Colonel Jones VC who was killed while leading his troops at the Battle of Goose Green. A total of 777 personnel were wounded during the war of which 581 were evacuated to the hospital ship Uganda, 569 were evacuated to the United Kingdom through Montevideo. Most of the dead were returned to Britain after the war had ended. This was the first time ever that the British Government had returned the remains of service personnel killed over seas. Until the Falklands War all remains of British servicemen killed overseas remained in whatever far off country they had fallen. 23 bodies did remain in the Falklands and are buried at the "Blue Beach" Military Cemetery at San Carlos not far from where 3rd Commando Brigade had its headquarters until the breakout. Many of the bodies of the men who died at sea were never found and the ships on which they served and died on have became their everlasting and official memorial. Badge Type: High quality hard enamelled badge complete with brooch pin attachment. Size: 28 mm tall by 33 mm wide. Colour: Royal blue and polished gold. 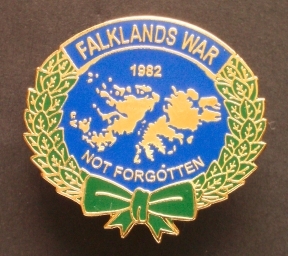 Obverse: Depiction of Falkland Islands with the legend "1982" above "NOT FORGOTTEN" below all surrounded by a wreath above which is the legend "FALKLANDS WAR" within a framed border. 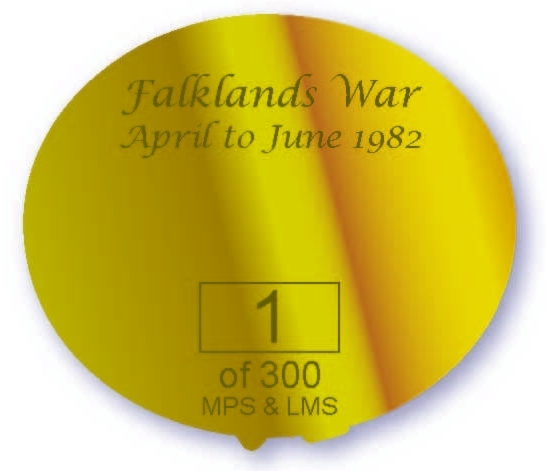 Reverse: Engraved on the reverse in two lines the legend "Falklands War / April to June 1982" plus a unique stamped issue number out of a stated total of 150 making each badge unique. Badge makers marks in exergue. Only 150 badges are to be made making them a limited collectors edition. Price: £4.00 plus postage and packaging. Each badge is dispatched by first class post with a Royal Mail proof of posting certificate. See below for postage options and rates. Colour: Royal blue and polished silver. Availability: Release date 28th May 2007. As of 16th November 2010 we have 9 of the total stock of 150 badges left in stock. 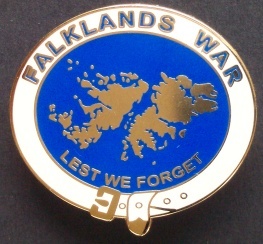 Colour: Cream, royal blue and polished gold..
Obverse: Depiction of Falkland Islands with the legend "LEST WE FORGET" below all surrounded by a belt styled outer border design carrying the legend "FALKLANDS WAR". 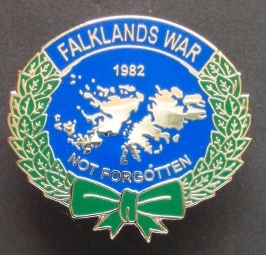 Reverse: Engraved on the reverse in two lines the legend "Falklands War / April to June 1982" plus a unique stamped issue number out of a stated total of 300 making each badge unique. Badge makers marks in exergue. Only 300 badges are to be made making them a limited collectors edition. Typical engraved reverse details on Badge Types I to III. Special Delivery (Insured) - £5.00 (Recommended for larger orders over 8 badges in size). None insured First Class Airmail Delivery - £1.75. Mailing option is at buyers choice. The seller can not take responsibility for any losses in the postal system. 2, Mill Terrace, Thorpe Thewles, Stockton-on-Tees, Cleveland. TS21 3JS. Badges will be despatched immediately on clearance of payment. To reserve your badge e-mail: linda.smith64@virgin.net or telephone UK (0)1740 630014. We can accept secure on-line payments via Paypal sent to us on the above e-mail address. However, on orders of 5 badges or under we would request customers pay an additional sum of £0.50 per order to cover PayPal's handling charges.